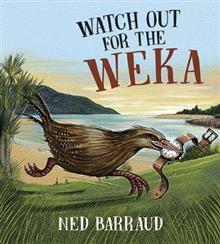 While Alf, the DOC hut warden, is taking a swim, a curious weka steals his precious watch. He must get it back. That evening, Alf thinks up a cunning plan and eventually recovers his watch while also discovering the weka's treasure pile. Based on a true story, set at Awaroa in th... read full description below.